Alavus is a municipality in Southern Ostrobothnia. 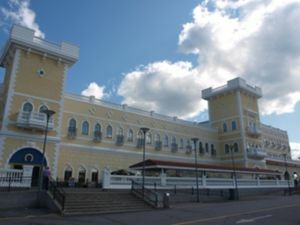 While driving around South Ostrobothnia, in the middle of the nature can suddenly be changed by this enormous shopping mall located in the municipality of Alavus. It is a real Oasis for shoppers in the middle of the peaceful and natural Finnish landscape. 'Veljekset Keskinen', as it is named in Finnish, is situated in the village of Tuuri with only 500 inhabitants. This mall is very particular, it consists of different units all put together. Every unit has its own name. There is a Department store is the place where to buy nonfood items, a Food store, and the Garden store that sells all kinds of items for gardening. There is also the Hotel OnnenTahti, restaurant OnnenKivi, traffic centre OnnenLiekki, caravan area Onnela and two Shopping alleys with other entrepreneurs. The restaurant services offer all kinds of delicacies: there are three cafeterias, two grills, one pizzeria and one á la carte restaurant to choose from. According to its sales, Veljekset Keskinen Ltd is the second best in Finland after Stockmann in Helsinki. It started as a tiny little village shop and has grown heavily during the years, both in size and the product range. At the same time it has become surrounded by the whole village of different stores: over 60 enterprises do business in the neighbourhood, for example clothes shops, car dealerships, a liqueur store, a pharmacist’s, a jewellery store, an optician’s, a travel agency, a private clinic, a miniature golf track and a labyrinth world. The VillageShop sells over 250 000 different products which will surely meet the needs of each and every customer. According to the Finnish Tourist Board, the VillageShop is the most famous tourist attraction in Finland with over 6 million visitors per year (2008). The University of Tampere has made studies every year ever since 2001 which show that people drive approximately 150 kilometres to get there and in July even more (over 200 kilometres). The VillageShop is the best known for its events. There are over 50 smaller or bigger events at the premises of the VillageShop every year. All the happenings have a common name: Million. There is a Million Ice Fishing, Million Rock, Miss Million, Million Skidoo, etc. They all have gathered thousands of people here. During winter time there is some dancing playing during the day, especially dedicated for elder people. During the summer time there is a huge outdoors playground for kids. Among many games they include an enormous labyrinth, slides, and many more games where kids can play for hours. The restaurant services in Tuuri offer all kinds of delicacies: there are three cafeterias, two grills, one pizzeria and one á la carte restaurant to choose from. Hotel OnnenTähti has 35 double rooms of a suite level. The smaller rooms are 40m2, which is about twice the size of normal double rooms in other hotels in Finland. All rooms have chandeliers and suitable furniture designed specifically for this hotel. Furthermore, rooms have the possibility of adding an extra bed for the children. Room prices vary from €100 a night up to €150 for suites (all of them including breakfast, the use of saunas and internet connection). The hotel also provides equipment and good setting for meetings and other events (big or small). There is an auditorium with 117 seats, two conference rooms (16 and 60 seats) and three workrooms with 10 seats. The auditorium is equipped for video conference. Southern Ostrobothnia is a good place to visit if you want to spend some nice quiet days in the countryside. In the vicinity of one of the main attractions in the municipality of Alavus, the Shopping Village in Tuuri, you have at least 4 possibilities of rural accommodation to choose from. If you want to spend some time in a typically Finnish farm, you should go to Heikki’s Cottage. You can enjoy the natural surroundings, the view by the lake, the farm animals and the everyday routine of a day on a Finnish farm. Heikki’s Cottage is a house built in the Ostrobothnian style in 2000, and has 3 rooms with 4 beds and one twin room. There is also the ‘Akkala’ building that can accommodate a family of 6 members and a summer cottage, called ‘Kangas’, that has room for 8 people. The price starts from €35 per person for one night. You can find lodging there all year round and enjoy the tranquility of nature and the wonderful view by Akkojärvi Lake. There is a sports court by the cottage where you can play volleyball or badminton, and you can even use the cottage owner’s boat to have a tour of the lake. Traditional smoke sauna is also available, and can be booked for a reasonably low price, only €200 for a group of minimum 2 and maximum 12 people. The grill is inside a nice log cabin and you can use it for free. One thing you won’t easily find elsewhere is the chance to have a professional massage while on holiday. This is optional, but could bring a huge plus to a complete relaxation holiday in the countryside. The price for a massage session is €17 for a partial massage and €35 for a full body one. Heikki’s Cottage is 15 km away from Tuuri Village Shop and 35 km away from Ähtäri Zoo. Address: Lehtimäentie 1147,63640 Ritola, Töysä ,☎ + 358 6 526 6620. If you search for a family holiday in the countryside the best place to start is Ouran Loma. 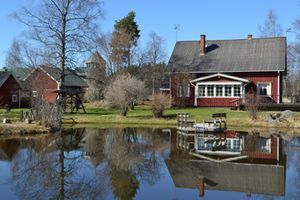 A holiday at Ouran Loma reminds you of the times you spent as a child at your grandparents’ place in the countryside: beautiful surroundings, cozy atmosphere, homemade Finnish food and friendly people. There is also a pretty garden with wooden sculptures and a small pond. The premises are child- friendly and really tidy, so you don’t have to worry about safety, you can just rest and enjoy nature and the countryside view. The ‘World Watch Tower’ makes this place really special. As you climb up you can admire glass painting, instances of the four seasons, and on top of the tower ‘a blue sky with colorful sparkly stars’, as well as a nice view of the outside surroundings. Ouran Loma can accommodate up to 30 people in the Grandmother`s House and Mill-cottage throughout the year and 15 more in their romantic barns during the summer. The rooms have excellent facilities and there are a modern sauna and a traditional smoke one, as well. Rooms have their own bathroom and small kitchen, and you can use the washing machine and the tumble drier, if you need it. The room price per night is €60 for a double room or €70 for a three bed room. The price slightly changes depending on the number of people or the type of accommodation you prefer: in the main house, in the mill- cottage or the romantic barns. The dining room is in fact a small restaurant and you can have there both a large party and a nice, family meal time. Breakfast costs €8 per adult and €5 for children between 3 and 11. For groups, you can arrange in advance to have lunch or dinner. Liisa Kokkonen, the owner, is the genuine grandmother figure and can help you organize different activities on the premises of the cottage or trips in the area. In the neighboring town there are a nice spa, a sports arena, tennis courts, a riding school, historical sites as well as a golf course only 22 km away. They can also pick you up from the airport or railway station, if you need it. 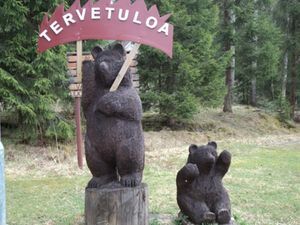 The Ouran Loma is just a couple of kilometers away from the centre of Alavus town and 9 km from Tuuri Village Shop. Address: Nurmitie 76, 63300 Alavus , ☎ +358500 865 523. If you are interested in a budget holiday, you should go to Sepänniemi holiday village in Töysä, Alavus municipality. The holiday village has 12 cottages, 20 caravan places with electricity, 2 saunas, space to set up your own tent and a grill shed. Sepänniemi holiday village is 8 km away from Tuuri Village shop and 25 km from Ähtäri Zoo. There are 4 cottages that provide accommodation for 4 people and 8 cottages that can accommodate 6 people. They have electric heating system, cold water plumbing, cooker, fridge and coffee maker. Some cottages even have sleeping loft, fireplace, firewood, warm water, WC, shower, TV and microwave oven. The better equipped cottages cost €90 per day, while the other cottages cost €75 if they accommodate 6 people and €65 if they are for 4 people. The tent or caravan place is €15 per day, the same price as 1 hour in the sauna. If you have little children with you, you can reserve a feeding chair or a bed. In the maintenance building there are WCs, showers, washing machine and woodshed. There is also a small beach by the lake Ponnenjärvi which offers new possibilities of enjoying time there, such as fishing or boating. The water is clean and shallow enough to be safe for children. However, if you want to go by boat on the lake, you need to ask for permission to use the boat and borrow life jackets from the restaurant’s staff. A small restaurant is also present on the premises of the holiday village and you can have there breakfast, snacks, drinks and even warm food. In addition, you can get fishing permits from the reception desk and rent fishing equipment or outdoor games. 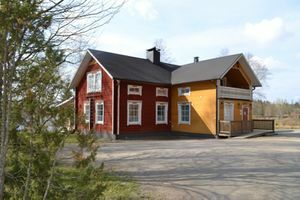 Near the holiday village, on the borderline to be more exact, you can find the Töysä Museum, which gives you an insight into the lifestyle of local people in the 19th century and the beginning of the 20th century. Within the inner yard of the museum, different events are organized during the summer, and a stage and dance floor is put up for group activities. One particular aspect about this holiday location is that every year, at the end of May a non-stop marathon around the lake is organized, and there are even people coming from abroad merely to participate in this event. Address: Niemenkyläntie 250, 63600 Töysä, ☎ +358 6 5261 550. If you want an activity holiday, you can start at Tuuri Inn, a place 1.5 km away from Tuuri Village Shop, yet far enough to enjoy the peacefulness of nature. 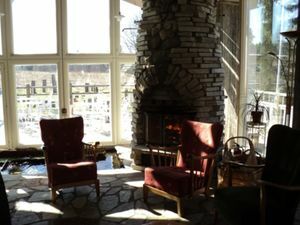 The inn is built in the neighborhood of three different water elements: a pond, a stream and a river with rapids. Facing the house there is a collection of stones displayed in such a way to remind you of a miniature Stonehenge. The living room has large windows facing a sunny terrace, a fireplace and a nice aquarium with colorful fish. The inn has 3 bedrooms that can accommodate 10 people, and a large practicable kitchen where the whole group can eat at the same time. There are also two saunas, one down the inn, in the little down valley beside the rapids and the other in the house. The Tuuri Inn is best known for its action holidays and all inclusive packages. The owner of the inn, also known as the Holiday Master, can take care of all the logistics for you and make all the necessary arrangements for the holiday of your choice. During the summer you can choose from canoe trips on clear lakes or rivers, ATV rides, hunting or fishing trips, bird watching, hiking or bicycle trips. During the winter, you can pick from husky or snowmobile safaris, reindeer rides, snowshoes walks and cross- country skiing tours. During those action holidays, you are accompanied by experienced drivers and guides, and the price of the holiday also covers insurance, in case of injury. For such an action holiday you need a group of minimum 4 people, the larger the group, the smaller the price per person. The price includes accommodation, meals, the planned program, transportation, taxes and insurance. For example, the price for 3 action days and 2 nights is €645/person for a group of 4 people and €395 /person for a group of 20, while 5 action days and 4 nights cost €995 /person for a group of 4 or €595 /person for a group of 20. 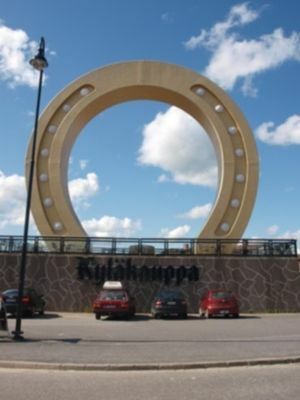 Address: Tuurinkyläntie 79, 63610 Tuuri, Finland. ☎ +358400515951. This page was last edited on 17 November 2014, at 15:56.